Mumbai, Dec 14 (IANS) Rani Mukerji's character mouths expletives non-stop in the much talked-about film "No One Killed Jessica". Director Rajkumar Gupta admits that the actress' character is "very brutal and graphic in her speech" but he is not so worried about the film getting A-certificate from the censor board. "We voluntarily beeped out Rani's expletive in the trailer because it was to be screened on the home viewing medium. But now when we submit the film for censorship, we will go with the entire language content intact, hoping the censor board would see the context and not just the hard-hitting nature of the language," said Gupta. "We are hoping for a UA (parental guidance) certificate. But even if we get an Adults certificate, we're okay with it," he added. The film is based on model Jessica Lall's murder case. In the film Vidya Balan will be seen as Jessica's sister Sabrina who fought tooth and nail to get justice for her sister. Rani plays a journalist. According to sources, Rani's character's flow of profanities is so non-stop that if the censor board decided to beep her gaalis her dialogue soundtrack would have more beeps than words. Laughs and protests Gupta, saying: "It' not that bad, really. You are making it sound like a non-stop abuse binge. My film is not that." "But yes, Rani's character is very brutal and graphic in her speech. I don't know if, as you say, Rani is the same way in real life. I didn't know her before I shot with her. But she was thoroughly professional in mouthing squirmy words." While Rani is said to be gung-ho about the language, Vidya Balan is apparently dreading how the dialogues would sound in a pindrop-silent theatre with dolby sound. "Let's just say, both Rani and Vidya said what they had to. They were thorough professionals," said Gupta. Another area of discomfort for the film would be the legal ramifications of showing real-life people, particularly the hostile witnesses in the murder case. Apparently some of the key witnesses are already inquiring about the content and getting ready for legal action. "We're ready for any eventuality. I made the film the way I wanted to as a mix of realism and cinematic entertainment. 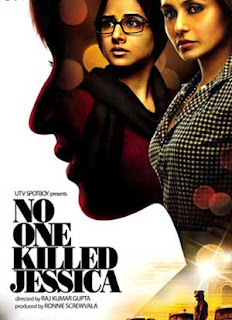 'No One Killed Jessica' is not a documentary on the Jessica Lall case. But it is about her sister's fight for justice. And if the real-life characters recognise themselves, they are welcome to react how they want." In fact, former top cop Amodh Kanth has urged the Indian censor board to ensure that only the facts relating to the Jessica Lall murder case are presented in "No One Killed Jessica".